I found this bronze wall plaque at a garage sale years ago. 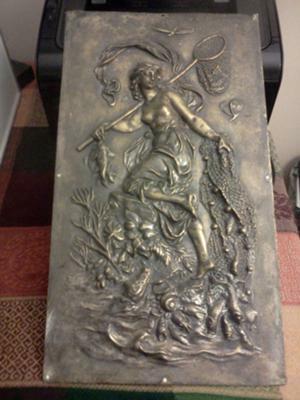 The plaque measures 19 inch by 10 and 3/4 inches and the decorative detail featuring a fishing Goddess is magnificent. The picture is of a woman with fabric tied at the waist and chest exposed (top of fabric fluttering in the wind). She is holding a fishing net over her shoulder. She has almost every type of sea life (her catch) surrounding her. A dragon fly above her head, fish in one hand and a net in the other spilling fish out. A crocodile is lurking at her feet, alongside lobster and sea snail. One of her knees is kneeling on a rock surrounded with sea grasses and barnacles. This bronze wall plaque is one of my favorite finds and I am not interested in selling it, but would like to find out more about its history. If you have any ideas, please comment. Hello, Wow! is your bronze wall plaque exactly the same? I have not discovered anything more about the plaque. Why do you think it is from Ireland and how did you come up with that era? I also have one of these bronze wall plaques and I believe it is from Ireland c1850-1890. Have you found out any more about it?